I’ve been doing a little bit more work with some spreadsheets recently and I came across a situation where I needed to work with a date and carry out a comparison to a string of text. My first attempt fell short as it wouldn’t get the value I wanted, but Excel’s TEXT() function came to my rescue. The issue came about like this. I wanted to take a date in the format “dd/mm/yyyy” in one cell and display it in a short date format of “mmm-yy” in the cell next to it. e.g. “07/01/2010” in cell A1 and “Jan-10” in the neighbouring cell A2. My original approach was to set the second cell to pick up the value of the first. So taking the example above A1 would contain “07/01/2010” and cell A2 would contain a formula “=A1”. I then set the formatting on cell A2 to a custom format “mmm-yy”. I next wanted to check if cell A2 was equal to “Jan-10”. This was where the issue arose as although cell A2 displays “Jan-10” its value is actually “07/01/2010″ … the value in cell A1. The value of cell A2 is then “Jan-10”. For me this highlights the difference between the content (what is typed into the cell, i.e. the formula), the value (what the formula evaluates to), and what is displayed (the value can be formatted to change how the user sees it on screen/printed). I’ve recently been helping some colleagues develop some reporting templates and they had a very particular requirement around drop down lists (which I’ll probably post about at some point in the future). One issue that did occur however was that the dynamic lists that were incorporated into the workbook were added to and even though I had mentioned to the users about using Excel’s name manager to redefine the range of cells with that name, they forgot and inevitably the workbook would end up back with me to rectify. I decided that I’d try and find a way of defining a range so that it would automatically extend itself when another cell entry was added to the bottom of the list. It turned out to be more straight forward than I’d initially thought it might be. The statement below sets a range that will begin at cell “A2” on worksheet “Sheet1” and extend down for the number of cells that contain a text entry. It assumes that the list is unbroken and that the top cell is the name of the list (hence the -1after the “COUNTA”). Whilst the name is not essential I include it as having the name of the list in the top cell allows me to prgramatically carry out list operations by referencing the top cell in a column. 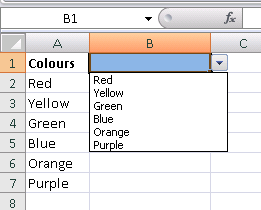 The screen shot on the right shows a sample list of colours that has a range defined by using the function above. A drop down list is automatically populated from this list and is shown in cell B2. I posted earlier about a better way for producing dynamic lists in Excel. One of the “tricks” I used to simplify things was using the text values of the items in a primary list to identify a secondary list to use. Here We have three lists with the options set as named ranges called “Type”, “Fruit” and “Vegetable”. Using data validation, drop down lists and Excel’s INDIRECT function means that if “Vegetable” is selected from a drop down linked to the “Type” list as a primary list, a related secondary list drop down will dynamically link to the “Vegetable” named range to validate the drop down. This eliminates the need to do any complex lookups, but complex lookups look like the option when confronted with a primary list that contains entriess that would be invalid as names for a named range. For example if we were looking at say UK regions and cities then an entry of “North Yorkshire” in the primary list would cause an issue as it contains a space which is an invalid character in an Excel name. My solution is to replace the space in the naming of the range with an underscore. This obviously won’t match to the entry in the primary list but we can use a quick substitution to accommodate this. 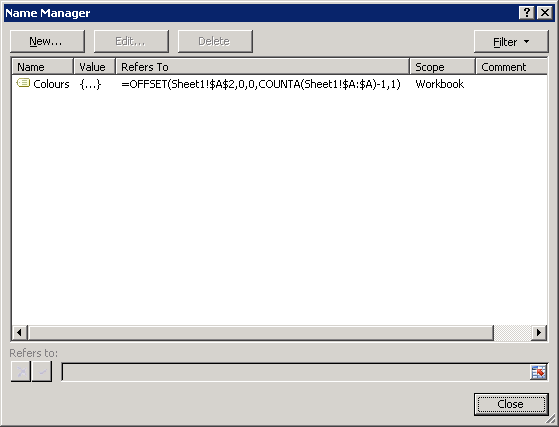 This would simply replace the spaces with underscores and provide the valid name for Excel to use. So we can still avoid complicated lookup functions and still keep things relatively simple and instantly readable.